Cooper will retrieve almost anything, anywhere. But Tooey has gotten thrown off from time to time in new places and with new people, and especially with new guys. So this was excellent training for her. Cooper did a long single, and then tried a triple, with the original single being used as the memory bird (the last bird to be retrieved). As usual, Cooper did things his own way. He retrieved the single just fine. Then he watched the triple go down, and retrieved the “go” bird (the last bird to go down and the first bird to be retrieved, out to the left), then the “memory” bird (the bird that goes down first, and is supposed to be retrieved last, out to the right), and then he couldn’t quite remember where the second bird went down (the middle bird, in the middle). OK, so back to the car for a moment to get a drink, think, and reflect. Mark and Kevin ran their dogs on marks of various sorts, and then Mark set out a couple of bumpers for blind retrieves, set farther out than any of the marks, just about 20 degrees off where the middle mark had been. 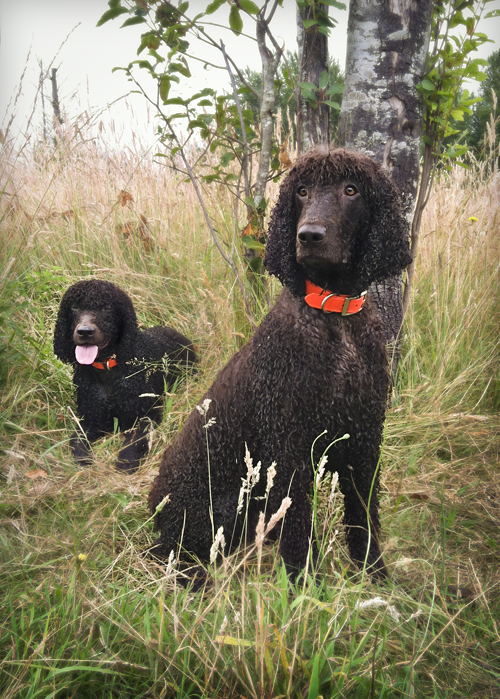 His Boykin, Piper did just find on the blind. Then we got Cooper out, with the idea of doing the single + triple routine again. Again, he went first to the “go” bird on the left, then to the “memory” bird on the right, and then sort of forgot where the middle bird was. I whistled him to sit, which he did. Then I sent him toward the bird with a “Back” command. He went back, right past the bird. Argh! He got so far out that he scented the blind bumper, zoomed over sideways to grab it up, and then delivered the bumper. OK, so not Master level work. I then had him retrieve that middle bird as if it were a blind. Which he got just fine. Silly boy. But we had fun. I don’t have any pictures, but Mark got some good ones. You can see them boy going to this post on his blog: RaisingPiper. Let’s get to the good news first: Tooey qualified. Today she earned the 2nd leg (of 4 needed) on her retriever Junior Hunter title. During the month since Tooey’s been home from being a mom, we’ve been getting her back into training for retriever hunt tests. Russ was convinced that she could do the work, and it turns out that she works really well for him. 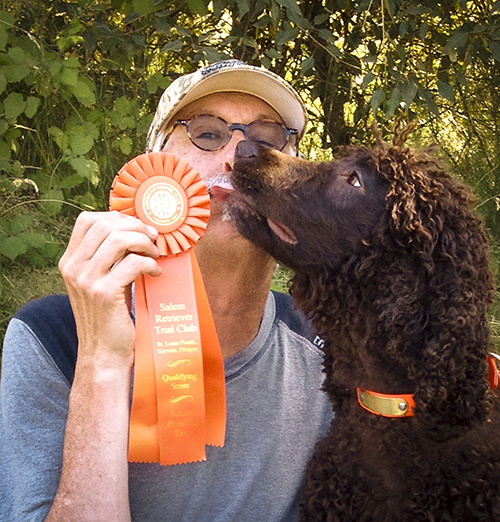 So we entered her in the Salem Retriever Trial Club test this weekend, with Russ as handler. The weather started out warm and cloudy, with a very slight breeze. The first series was held at a long beaver pond. The first mark was about 80 yards: 30 yards of land, 30 yards of running water filled with tall-growing reeds, and about 20 yards of swimming water. The duck splashed, and Tooey zoomed out, swam past the duck, turned around, climbed over a floating log, paddled to the duck, grabbed it, and came swimming and trotting back to deliver it to hand (good “Hold,” Tooey! ), all without getting her back or topknot wet. The second mark was about 60 yards, half land, half swimming water. Tooey is usually somewhat sedate in getting into water, but for this mark, she put on her full water spaniel style, and gave it a running leap. She grabbed the bird, and came back with it. My heart dropped a bit when she put the bird down upon getting back onto land (she has failed hunt tests for putting down the bird and refusing to pick it back up). Fortunately, though, she was just repositioning the bird in her mouth. She trotted back to Russ, got into a nice heel, and delivered the bird. Several hours later, we got to the land series, and the weather had risen into the 80’s F and sunny, with only the occasional breath of a breeze. The land series was held in field of mostly high grass cover with a few rows mowed into it. The first mark was about 90 yards. The first 75 yards or so consisted of a mowed row, and that last 15 yards was that high grass cover. That mark was hand-thrown using a giant sling shot, so birds sometimes landed into a low mowed section and sometimes into high cover. Tooey’s landed into high cover. She ran out to the area of the fall and searched the low stuff for awhile, scenting birds retrieved by dogs before her. But she widened her search into the tall cover, found it, picked it up, and brought it back to hand. The last mark was short, only about 50 yards. But short does not necessarily mean easy. The cover was so tall that once the dogs got about half way to the area of the fall, they completely disappeared. All the handler could see, really, was waving grass. Tooey went straight out toward the bird, but once she got out of sight, it was hard to tell where she went exactly. At one point, it appeared that she’d gone to a close-by area where ducks had been thrown on Wednesday at practice. No duck there. More waving grass. No Tooey. Finally, Russ thought he saw her stop at the spot where the duck had gone down, so he whistled her in. No Tooey. More waving grass. Nothing. Hot seconds pass. Russ waits, and the judges start shifting their feet. Finally, we see Tooey emerging from the cover with a duck in her mouth. Thank goodness. Good girl! And so she passed, with about half of the 32 dogs that entered. Amen. She delivered all her birds to hand. She ignored the gunners and the guys out in the gunner’s blinds. In the past, these guys have seemed to her to be completely out of place, so she’d stop her work while trying to figure this out. She did a water spaniel leap into the water. Yay, Tooey! A little style can go a long way. Now that Tooey is no longer in puppy mode, we have returned to training the dogs for both retriever and spaniel hunt tests. Wednesday was a training double header. 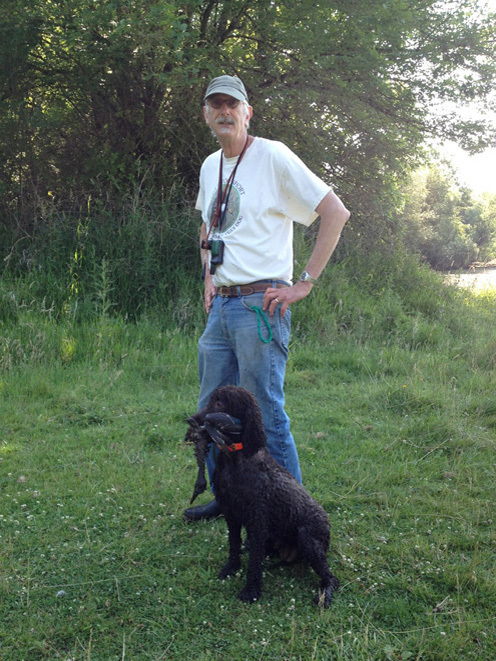 In the morning we worked on retriever work with the Poodles Taura and Remy, (Wednesday is Poodle day) and then quartered the field in the evening looking for chukars with our Boykin Spaniel training buddies, Norm and Scarlett. In the photo below, I was throwing and shooting for the Poodles while Tooey and Cooper were next to me in the honor position. I thought, “What an opportunity to sit tight and watch another dog get the bird that I shot.” The dogs were thinking, “Not fair!” But who said life is fair? Cooper was resigned to this unfairness, being a hunt test alumni, but Tooey stared at the activity with disbelief. You’re letting those Poodles get our ducks? There are a few more hunt tests this summer in both venues of retriever and upland work, so if Tooey continues to show the drive she exhibited yesterday, then we may enter her and see what happens. Tooey’s been back home for a couple of weeks now, and finally she’s getting back into the groove. She actually did a play bow to Cooper for the first time since she’s been back. Cooper was delighted, and they romped and stomped, zooming around the back yard. 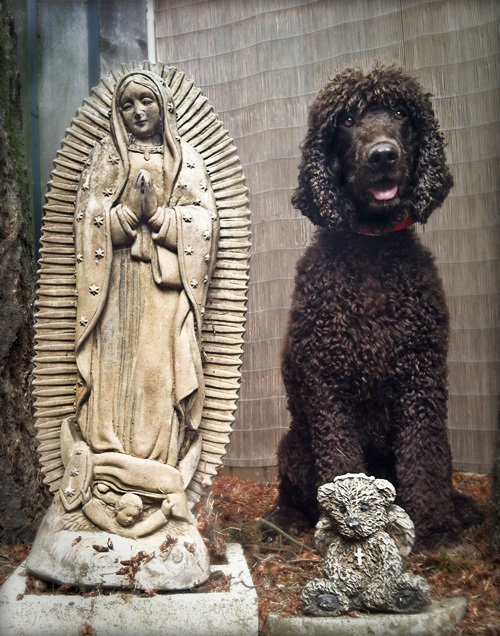 Later, she also consented to pose with her backyard buddies, the Virgin of Guadalupe and Gladly the Cross-eyed Bear. Tooey came back home from having her puppies a couple of weeks ago, but last Thursday and today were the first opportunities we’ve had to do some real field training. The last hunt test I took Tooey to, in May 2011, she failed because she would not hold onto the duck. She went out and got it, but instead of delivering it to hand, she dropped it 10 feet from the line. And then she would not pick it up. I’ve been working with her in the kitchen and back yard, where she’s done pretty well holding onto our well-used, frozen-thawed-and refrozen ducks. But this week out in the training field, Tooey has sometimes dropped the bird despite that. So this morning I turned Tooey over to Russ. Out of the four birds he ran her on, she dropped it only once, and then picked back it up and delivered it to hand. Russ worked with a combination of enthusiastic praise (good Hold!) and reminders (Hold!). But I think the keys are his excellent timing, knowing when to remind and when to praise. 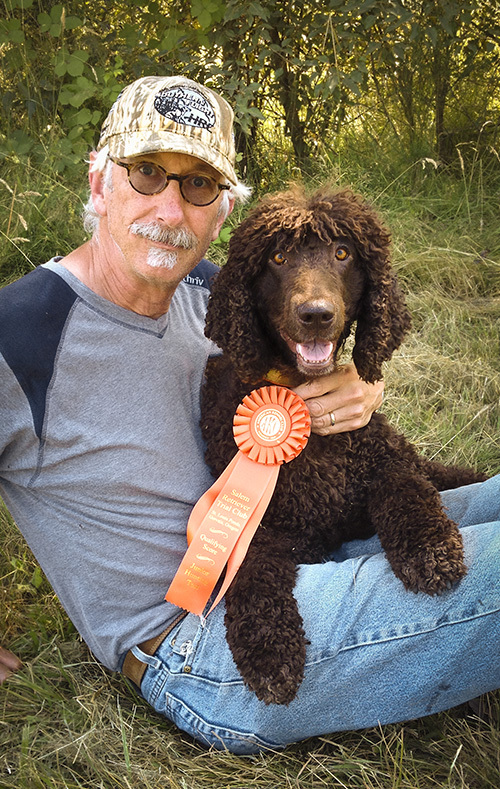 He’s also the one who has taken her hunting for upland birds and ducks. And then there is also the fact that he is Russ, and I’m not. There’s something about my relationship with Tooey that isn’t quite right. She thinks I am hers, rather than the other way around. I’m not sure why I think this is so, but the fact that she’ll hold onto a duck for Russ but not me is a clue. It’s something to keep thinking about. Orange has found his Someone. Or rather, his Someones. 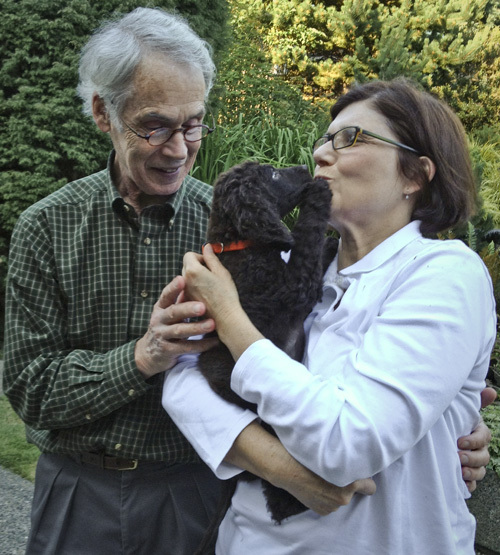 David and Shirley came this evening to pick up my sweet Orange and take him home with them. I was reassured to meet them both this past weekend, and watch them interact with Orange. And then just a day or so later, Shirley texted me, saying they were thrilled with him. I know what they mean. I would be thrilled with him, too. In a parallel universe, Orange is my dog. But in this one, he’s Shirley and David’s. I hope he turns out to be every bit the heart dog and companion for them as I would hope he’d be for me. In 1812, the German mineralogist, Friedrich Mohs, developed a method of comparing the relative hardness of naturally occurring minerals and gems. Diamonds top the list of the “Mohs Scale,” with a value of 10. Substances are ranked on this ordinal scale based on their ability to scratch or be scratched by another material. Glass ranks between 6 and 7, depending on its chemical makeup. And this is, of course, is why diamonds are used to cut glass. But in some cases, soft materials can actually scratch a much harder material. This is possible because of another phenomena in physics. When an object is in motion, it has kinetic energy that is described with this equation: Ek=1/2mv2. And if a soft material has enough kinetic energy, some interesting things can happen. When the softer material’s motion is abruptly impeded by a surface, the kinetic energy is transferred to the stationary material that is resisting that motion. The subsequent energy dissipation will override the relative hardness disparity between the materials, and the harder material can be abraded by the softer material. Now it is time to take classroom science into the field. On Sunday, Miss Tooey, recent mother and demure princess that she is, threw a temper tantrum when I had the audacity to take Cooper out of the truck for a bit of field training, while leaving her to watch from the cab. 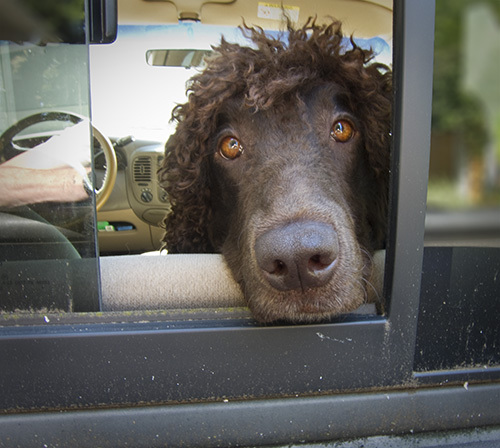 In this case, the nails of an Irish Water Spaniel (2.5 on the Mohs Scale), were propelled with enormous velocity at the back window of my Ford truck. The kinetic energy was then transferred onto the surface of the glass (6.5 on the Mohs Scale). And indeed, there are plenty of scratches to prove our theory in Newtonian physics and materials science. Having already replaced this window once this year, I am going to have to live with the results of Tooey’s science experiment. Now, every time I look in the rear view mirror and see the scratches, the term “Mohs Scale” will flash through my mind.